So this was the start of our every day. In a cold (very) and dark, dampish army tent, we would get blasted with this lovely sound. The first morning it came as a big shock, but at least it got us all out of bed. In fact it probably got the whole of Lands End out of bed too. The route we knew was going to be around 97 miles. What I don’t think anyone knew really was just how hard this would be, certainly not me. Not helped by the easterly wind (I will try not to keep mentioning this, honest, but we did end up cycling into it for all 344 miles), the hills were just horrible, in fact some of them were bad going down too. The reason for the bad ones going down were that many were on very narrow country roads with grass growing down the middle, a 25% slope, and high hedges each side. This meant that the best you could do was to cling onto the brakes all the way down and hope that you didn’t fall off. This hurt your arms and hands a lot, and I just wasn’t used to it. The hills I am used to cycling down are wide open, and you can freewheel, let yourself go and feel the wind in your hair. Very few of these allowed that freedom at all. Some of the hills going up were so steep that my lack of triple chainring was apparent immediately. I reckon that 90% of people on the ride had a triple, and all of the experienced guys certainly had them. I was stupid, just didn’t know, and paid for it. You cannot do 25% slopes on a double, or I can’t anyway. In fact if I hadn’t had the 11-28 cassette fitted to my bike the week before I went I would have been walking half of the hills in Cornwall, and would probably still be there. I am glad to say that this was my only regret of the whole trip, but it was a significant one certainly. By the first pit stop however at 25 miles or so, I was flying along, and loving it. I think I knew that I was ready for the whole thing, as I was psyched up and determined. The other thing is that you are certainly carried along by the momentum, of riding with 150 people or so – there was always someone behind you or in front of you to keep you spurred on. 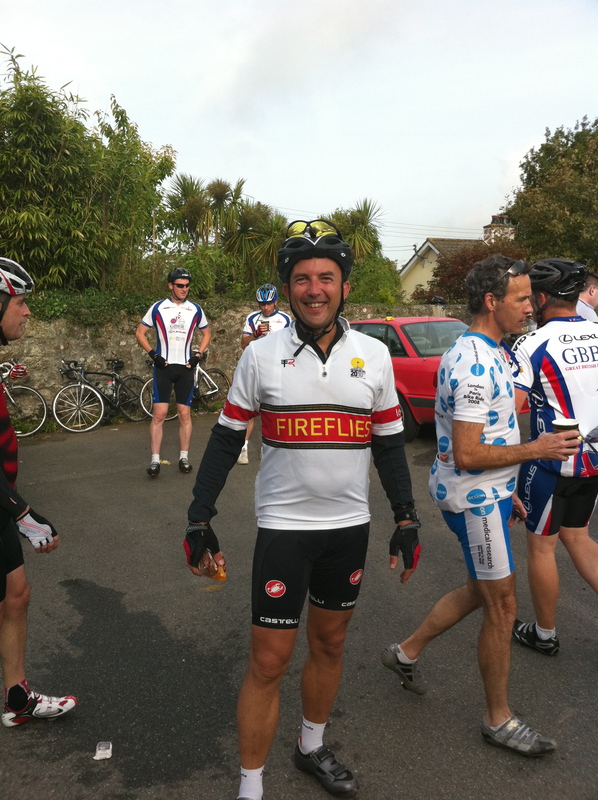 Here I was at the first pit stop – still smiling! So that is the last 45 miles post lunch. 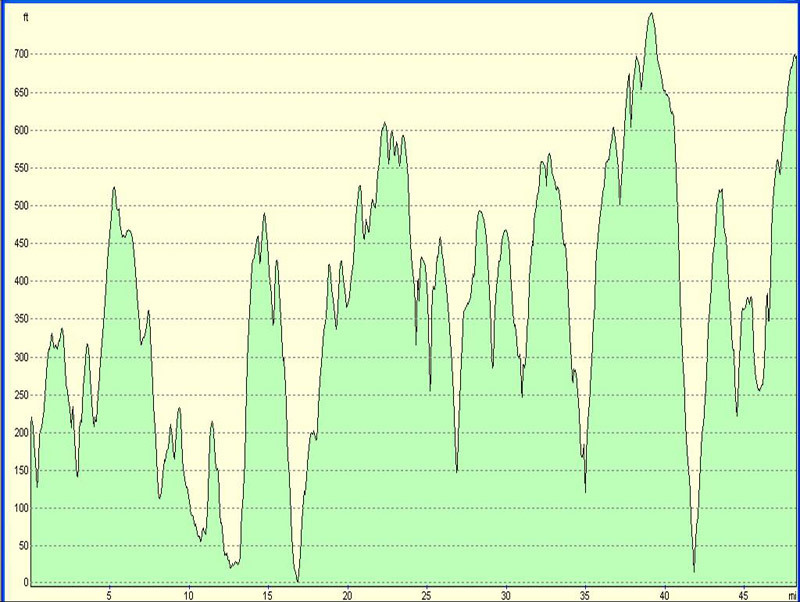 Following a nice descent around Callington and towards Tavistock itself, the climbs following both were absolutely horrible. Just what you want when you are nearing the end of the first 100 mile cycle of your life, and after about 9 hours in the saddle. I think I reached Tavistock at about 4.30pm. The climb up to the club itself was horrible even. It was nice as we arrived though that all the army guys were there and plenty of people from the rugby club to clap us in. There was also a film crew there from BBC Cornwall, and I think I got filmed – it would be nice to see that someday and I must find out if it exists somewhere. Having parked the bike up I found out that I had finished in about the first 30 riders. Whilst this is by no means a race or anything it was a huge boost to find that out for me. I went and got myself booked in for a massage, which hurt about as much as climbing the 1 in 4 hills did! It was a thorough sports ‘deep tissue’ massage, of the ‘no pain no gain’ variety. I think I probably felt the benefit the next day but at the time it was nothing short of agony! Dinner in the clubhouse was a feast of pasta, chilli con carne and curry all piled high on the same plate, followed by a dessert of meringue and fruit. I was ravenous. I managed to avoid a beer, being the good, strong willed soul that I am:), and was tucked in bed by about 9.15. 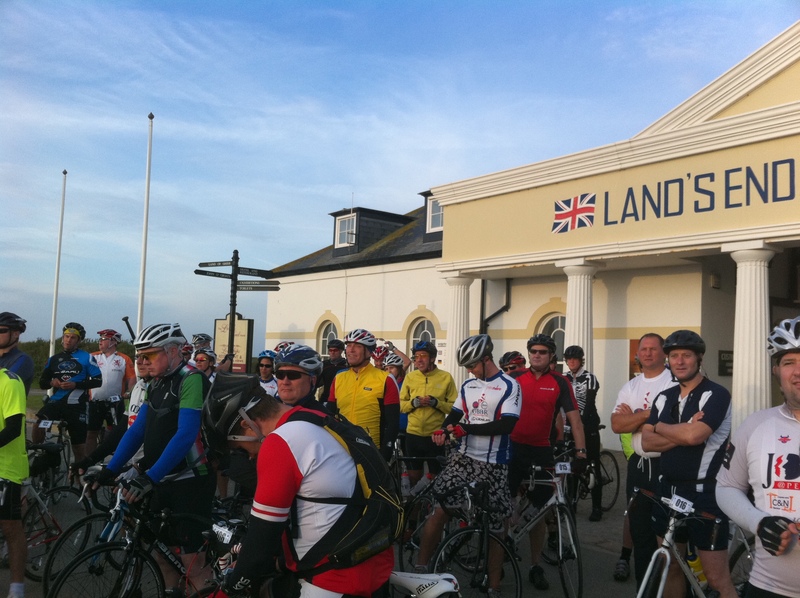 This was after the ubiquitous briefing telling us what lay ahead the next day (90 miles of Devon basically, and another 2,390 metres of climbing). Sleep itself came very very easily (always does for me, I am lucky like that), although the night was to prove very cold indeed. We were camped at about 700 feet, looking at the edge of Dartmoor, and the wind was blowing a misty coldness through the camp. I hunkered down into my sleeping bag, not wanting to get up to pee in the middle of the night because of the cold, and awaited the sound of the bugle at 5am. The start of the next day we knew was going to be a total pig of a climb – the locals referred to the start of the route over Dartmoor as “Eight Mile Hill”, and we were about to find out that they were definitely not kidding.